Vinyl windows are the best choice you can make for your Brampton windows replacement. They are beautiful, affordable, and energy-efficient. With vinyl windows, you will save money on your energy bills and home maintenance. The windows won't rot, rust, or warp, and you don't have to paint or seal them. This myth persists because people get an idea in their minds about what vinyl windows look like based on the material, but they don't actually check out any examples of vinyl windows. In reality, vinyl windows can replicate the look of almost any other type of material. Some vinyl windows are designed to even look like traditional wooden windows. You can buy vinyl windows in a large variety of styles, colors and finishes. You can create any look you like, and the right choice will make your home look even more beautiful than it already does. 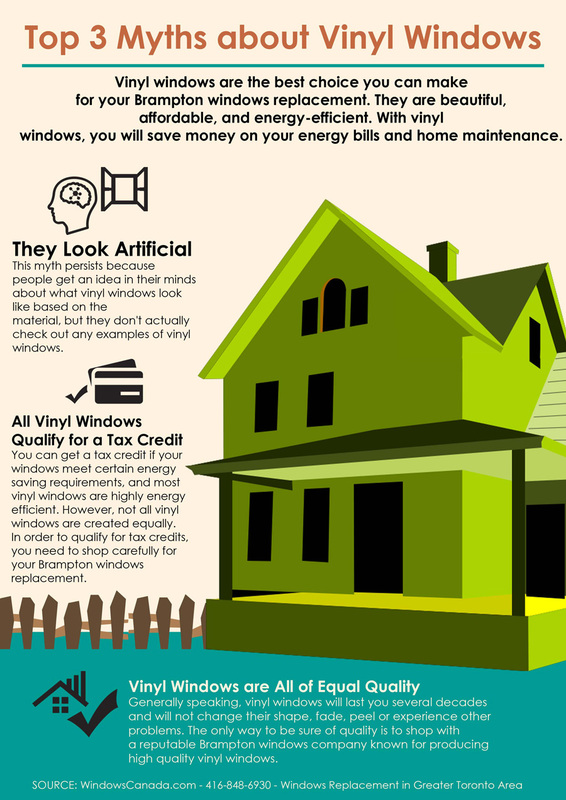 You can get a tax credit if your windows meet certain energy saving requirements, and most vinyl windows are highly energy efficient. However, not all vinyl windows are created equally. In order to qualify for tax credits, you need to shop carefully for your Brampton windows replacement and choose vinyl windows that have superior construction. All windows include information about their energy savings. Look at this information carefully to ensure that your vinyl windows will bring you the savings you want, and ask the provider detailed questions about the construction of the windows. Generally speaking, vinyl windows will last you several decades and will not change their shape, fade, peel or experience other problems. But not all vinyl windows are made of the same quality, and some may fail to leave up to these expectations. The only way to be sure of quality is to shop with a reputable Brampton windows company known for producing high quality vinyl windows.